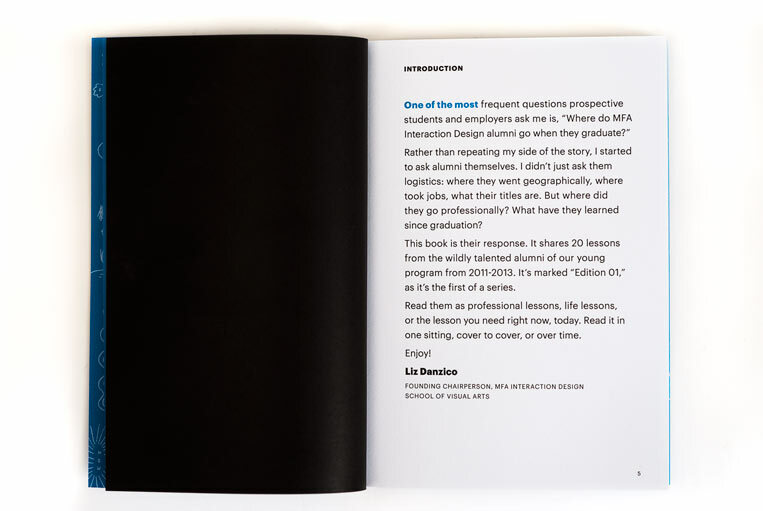 Designed for the School of Visual Arts in New York, 20 Lessons in Interaction Design: Stories from SVA’s MFA Interaction Design Alumni asks grads from the school’s influential IxD program to share what they’ve learned since graduating. 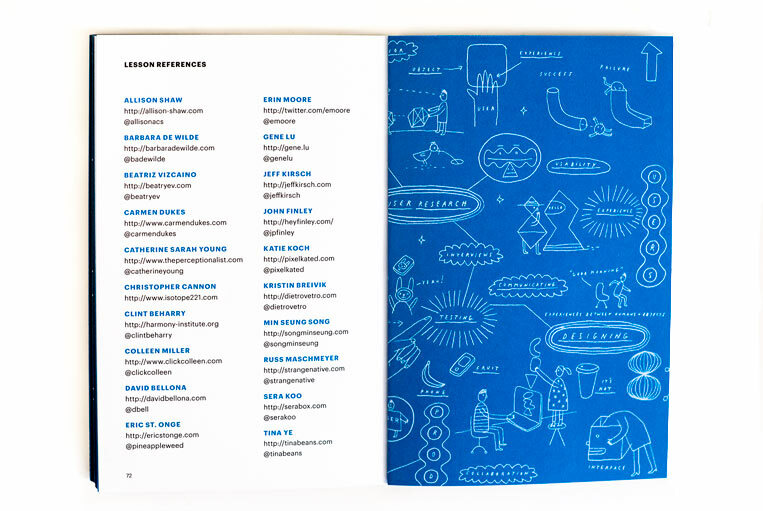 Li’l Robin collaborated on the project with Liz Danzico, the founding chairperson of SVA MFA Interaction Design, and the illustrator Brian Rea. 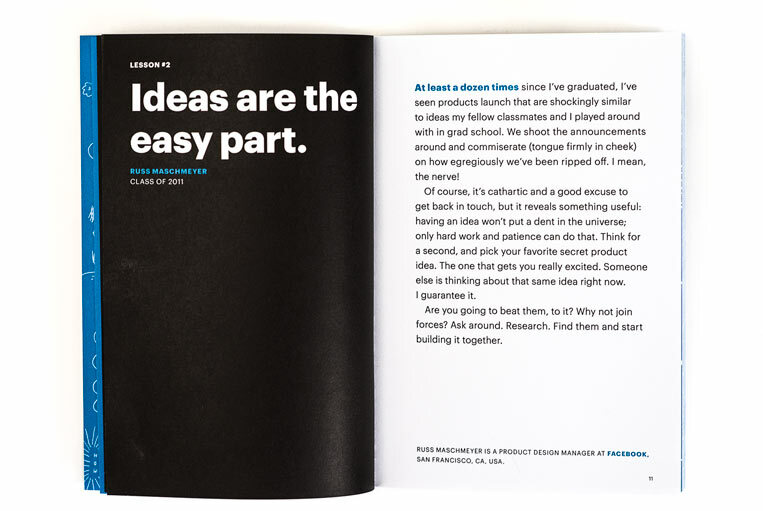 Instead of developing a traditional marketing brochure, Liz wanted to create a special publication that gave readers a look at the design thinking of the program’s graduates. Interaction design is usually thought of as design of interfaces for screen-based applications like iPads, iPhones, websites and social media. While it includes all these things, it is at heart a broader discipline that designs experiences and relationships—between people and technology, people and objects, people and services, and people and people. 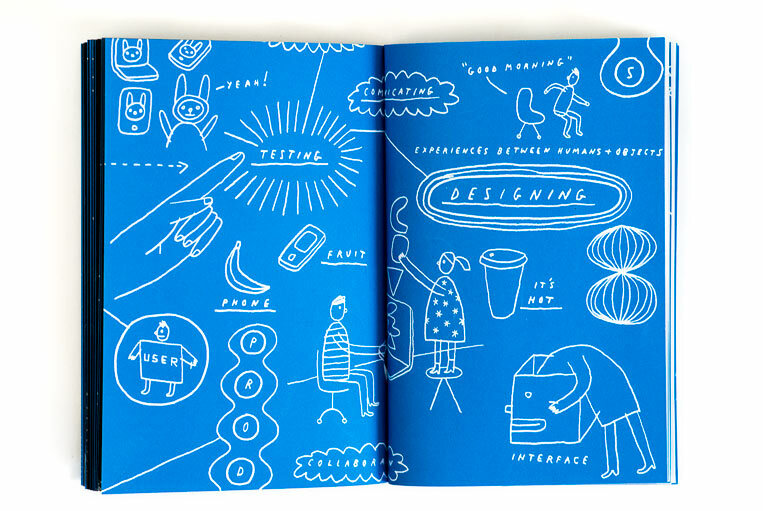 Founded in 2009, SVA IxD has quickly become a leader in the education of interaction designers, with alumni placed at companies like Apple, Facebook, Twitter, Yahoo!, The New York Times, and many other organizations. 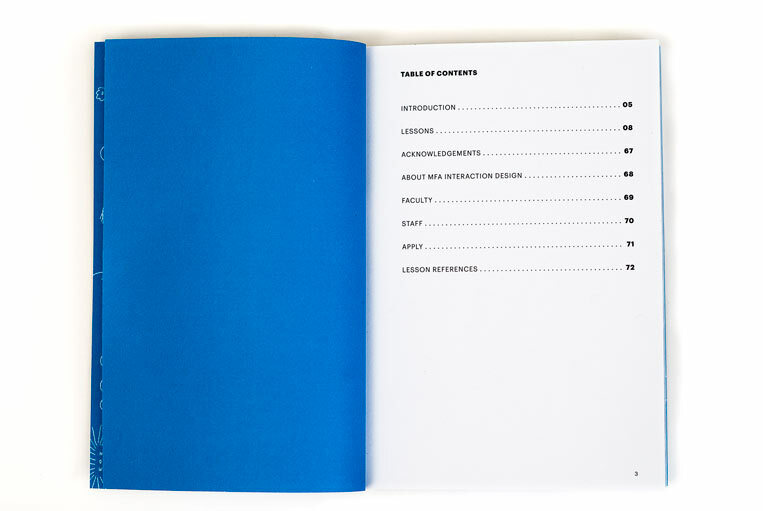 The book is designed to feel like a special object that can be kept and dipped into for moments of inspiration or out of curiosity about the program. Small but thick (it’s 72 pages), it’s perfectly sized to be carried around and slipped into one’s bag. Each lesson is numbered and opens with a short quote from the alum that leads into a longer statement. Titles and places of employment give a clue as to where their ideas have taken them. 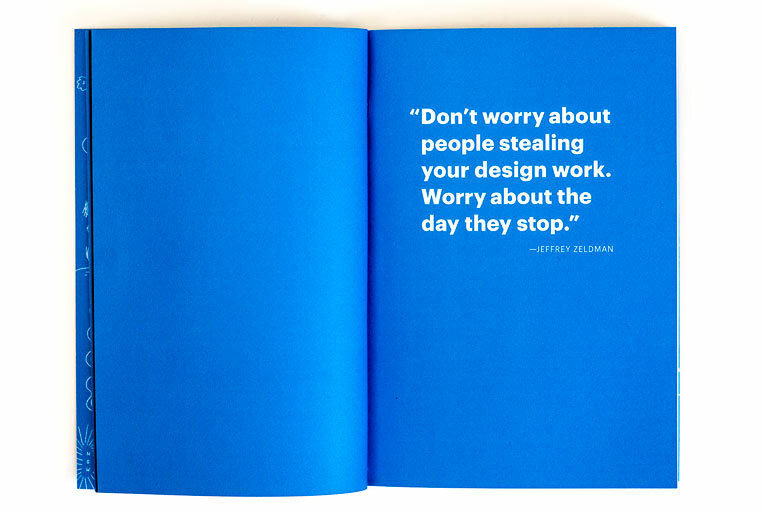 The lessons are interspersed with other quotes by leaders in the field, many of them faculty in the IxD program. The typefaces and color palette are based on IxD’s graphic identity. 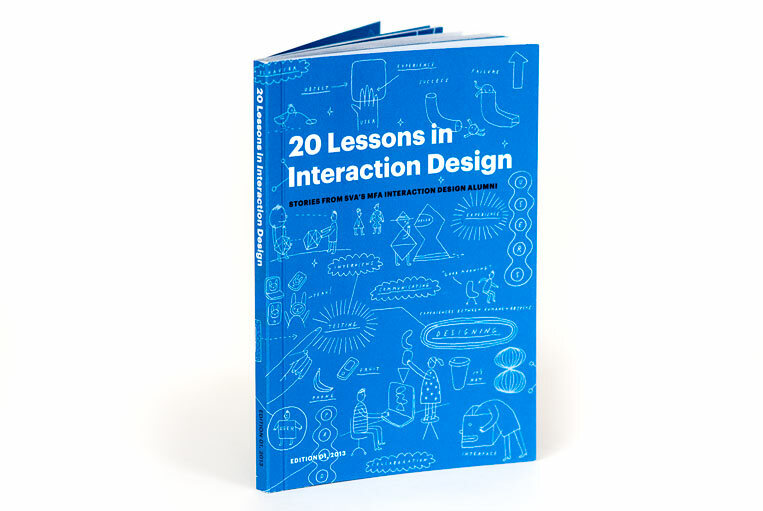 A series of illustrations by Brian Rea adds another layer of information by visually explaining exactly what is involved in interaction design. 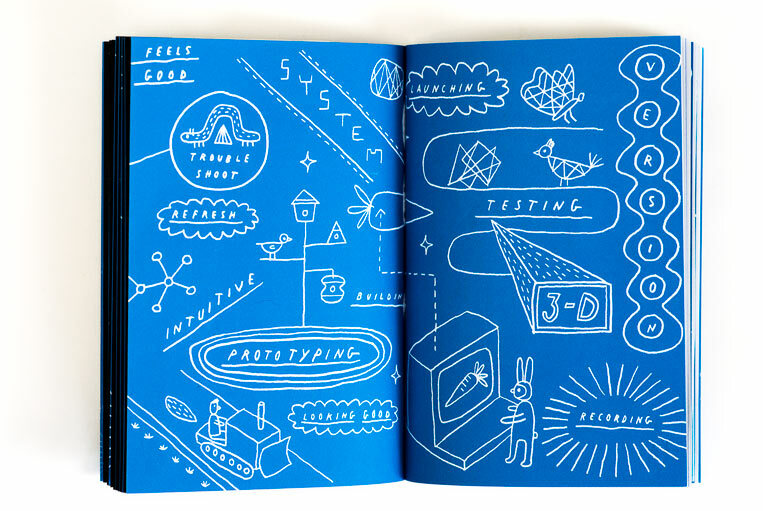 Appearing at intervals throughout the book, the drawings describe steps of the interaction design process like brainstorming, user research, prototyping and coding.